I owe my relationship to flamenco to my mother, Andrea Lippai. She first made contact with flamenco in 1991, a year after I was born, at a time when there was almost no flamenco in Hungary. I, however, had the privilege of listening to these special rhythms and songs from my very earliest childhood. I became a member of the FlamenCorazonArte Dance Theatre Company in 2004. Since 2008, I have been the solo dancer and also the assistant choreographer for the company. I was only 19 when I successfully applied to the Conservatorio Profesional de Danza in Seville and was immediately accepted into the third year of the course in flamenco dance. In May 2013, I graduated in flamenco dancing as the first foreign graduate of the Spanish institute. During my four years' study in Andalusia, I performed many times in different flamenco clubs, cultural centres and theatres in Seville. Until now I return regullarly to act and to continue to develop. I had the honour of choreographing a dance for the European Commission’s year-end gala in 2011. The following year, I was invited to perform in Warsaw at the 40th anniversary celebration of the university’s Iberian Studies Department. Due to the great success everywhere in 2015 and in 2016, I went on tour with "Suspiros-Sighs" accompanied by my fellow musicians Cristina Soler, Juan José Bando, Gergely Tar and Szirtes Edina Mókus. 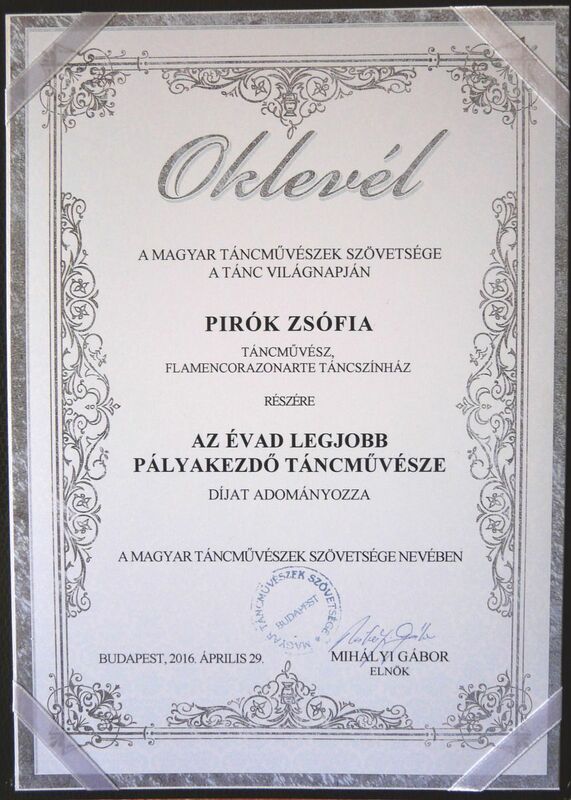 On 29 April, 2016 I was honoured by the "Hungarian Dance Artists Association" with "Season's Best Young-Stage Dancer" Award in the Palace of Arts, Budapest, on the International World's Dance Day. In 2016/17 I focused on creating new shows.